The patricians in Ancient Rome were considered grossly wealthy for their time. They lived in palaces, had numerous servants who fed them, cleanse them, and empty their chamber pots. But even with all of this lavish wealth, the Ancient Romans did not have toothpaste, mouthwash, nor any form of laundry detergent. Sure, the ancient Romans achieved impressive architectural feats such as the Pantheon and Colosseum. But when it came to personal hygiene, the Romans were lacking. So how did they clean their clothes, you ask? Well, they didn’t have detergent. Nor did they have soap, which did not exist until hundreds of years later. Still, clothing had to be cleaned somehow. According to Serious Facts, a servant at some point had the sense to urinate on their master’s clothing, and soon realized this actually make white clothes whiter and colored clothing brighter. Perhaps the young servant did not realize urine contained ammonia, a cleaning agent found in many of our modern day products such as Windex and 49. Thus, urine became the staple clothing cleaning agent. 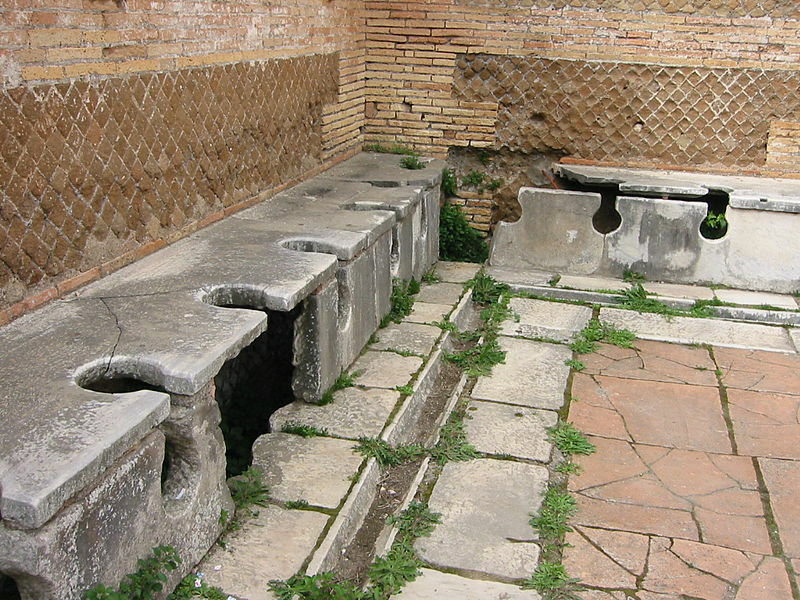 Public latrines in Ancient Rome. The process by which servants and clothing cleaners began obtaining enough urine to clean loads of laundry is kind of intriguing. According to Yahoo, urine vessels would be placed on street corners for people to use in public in case they needed to relieve themselves. (My guess is typically men would be the ones more likely to use them). The urine was then carried back to the fullonica (Roman laundromat) where it was diluted with water. The dirty clothing was soaked in this mixture. While it soaked, someone would occasionally stand in the urine and stomp on the clothing to provide the ‘washing effect’ of modern day machines. Afterwards, the clothing was rinsed again in water to remove the smell of urine. And voila! You have clean clothes. But urine wasn’t just used for cleaning clothing in Ancient Rome. Once it was discovered how powerful of a cleaning agent urine was, the Romans began using it as toothpaste and even mouthwash! Can you imagine people today using urine as a means to cleanse our mouths? I’d say our modern day society has an opposite view on the ‘cleansing’ factor of urine compared with that of the Ancient Romans. Then again…they say if you’re without a first aid kit, urine will disinfect and clean out a wound better than anything else.